Topics covered include: General Insurance, Government Regulations, Homeowners’ Wordings and Extensions, Farm Coverages, Automobile Insurance & Endorsements, Broker Ethics and Travel Insurance. Topics covered include: Risk Assessment, Fire Policy, Named Perils and Commercial Building, Stock & Equipment Broad Form Wordings/Extensions, Transportation and Contractors Coverages, Bailees, Crime and Business Interruption Insurance. ITAC’s course fees include access to online content (pre-work, practice quizzes and exercises), class workbook and practice exam. Note: CAIB Exams and manuals are not included in our pricing. You must register for the national exam sitting through your local Broker’s Association. 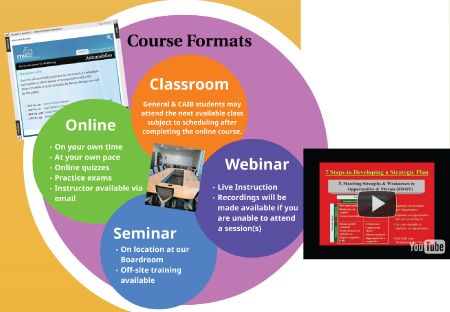 Your exam fee should include your CAIB manual, a Study Guide and a Student Resource Guide. Topics covered include: The Law, Liability Exposures, Commercial General Liability (CGL) Wording and other liability wordings. Commercial Automobile, Marine Cargo, Aviation Insurance, Surety Bonds and Risk Management are also covered. Topics covered include: Planning, Organizing, Human Resources Management, Leading, Monitoring, Customer Relationship Management, Technology and Financials. ITAC’s unique web-based education site makes training and accreditation quick and convenient. Classes will be conducted at the ITAC training center, located at 250 Brownlow Ave., Dartmouth, NS. Classes will be offered either as a 2-4 day immersion program or evening class sessions. We are prepared to come to any location where the need warrants*. ITAC will take care of arranging the training facility to accommodate the group. ITAC has successfully conducted these courses exclusively for the staff of one broker*. This format allows the additional benefit of promoting a Team Building environment with only your staff in attendance. These are all three-day courses designed to prepare the participants to write the national IBAC examinations. We offer courses for all four levels of the CAIB program. We have maintained an excellent success rate in terms of examination pass. Our online and webinar options allow you to reduce travel expenses and time away from your families. Employers: you can schedule group training onsite or off-site (bring ITAC to your boardroom). Weekends are not a problem! Note: CAIB Exams and manuals are not included in our pricing. You must register for the national exam sitting through your local Broker’s Association. Level I explores all aspects of Personal Lines Insurance Coverages. Topics covered include Government Regulation, Homeowners wordings and extensions, farm coverage, automobile insurance & endorsements and broker ethics. Level II explores many aspects of commercial Property coverages. Topics covered include: risk assessment, named perils & broad form wordings & extensions, transportation & contractors’ coverages, crime & business interruption. Level III advances further into Commercial Lines coverages. Topics covered include: the law & liability exposures, the commercial general liability (CGL) wording and other liability wordings, marine cargo & aviation insurance, surety bonds and risk management. Level IV explores the many aspects of the management process within the insurance brokerage. Topics covered include the functions of planning, organizing, staffing, directing & controlling. Also included are marketing & automation. Level One Brokers need to be supervised by level two or three brokers. Level Two Brokers can work without supervision. All offices must have at least one Level Three Broker. Please refer to Insurance Agents License Regulations in your province for complete details.